Ecuadorians have a different take on New Year’s Eve than we do in the States. The practice of burning effigies at midnight, for example, provides a window into it. These effigies are typically made out of paper marchè, are often life-sized, and can carry the likeness of pretty much anyone or anything — cartoon characters, politicians, celebrities, farmers, welders, mythical creatures — all in impressive detail. Burning them at midnight signifies turning away with the bad things that happened in the year that is ending so they won’t carry over into the year that is beginning. If you were to make a list of things in the last year that you would like to put behind you, you will immediately discover what they are doing. It’s an interesting difference, these two ways of thinking about it. The Ecuadorians want to bring closure to the old year, and let it recede into the past, freeing them to move on into the new year. Americans tend to focus on how they can be more successful at achieving their goals than they were the previous year. I’ll leave it to you to decide which way you think is the better way. Here’s my personal rest-of-my-life resolution. I’m going to get off the body-breaking, soul-numbing, spirit-crushing grind that says, “Work harder, make more money, buy more stuff, and look good doing it.” I’m going to reclaim the essential me. The me I used to know, but lost track of somewhere along the line. It’s time to find him again. ‘Cuz I ain’t gettin’ any younger. 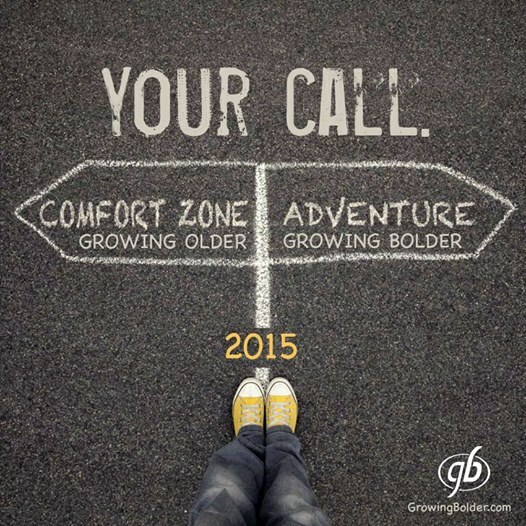 Trueda and I wish you an adventure-filled 2015, in which you are more yourself than you have ever been before.